Socialist Alternative Councilmember Kshama Sawant has been the most vocal councilmember in the fight to address Seattle’s housing crisis. Her office helped escalate a tenant struggle against a slumlord into the Carl Haglund law earlier this year, which restricted landlords from raising rents on tenants whose apartments contain code violations. Black Lives Matter activists aided by Kshama’s office recently succeeded in blocking the construction of a $160 million police bunker in North Seattle and now Kshama is working to build a coalition determined to reappropriate those funds for the construction of 1,000 low-income homes this year. In addition, her office has been working on an ordinance to reduce the financial burden placed on tenants when moving into a new apartment by capping move-in fees and allowing a payment plan for rental deposits. 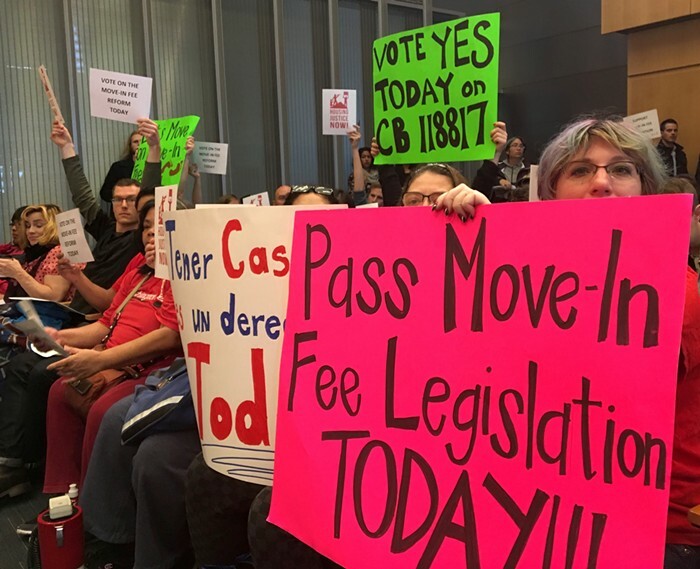 On Monday, October 17, roughly 50 protesters packed city hall to urge the Seattle City Council to vote the move-in fees bill. Despite intense support for the bill among speakers , many of whom came bearing signs with such slogans as “Housing 4 People not 4 Profits” and “Move-in Costs are a Crime,” the council delayed the vote. And, Councilmember Sawant made clear who was pressuring the rest of the council to do so. The Multi-Family Housing Association, a group representing property management companies across the state of Washington sent councilmembers an email with explicit orders to delay the vote to allow them time to amend it. The majority of councilmembers, all self-proclaimed progressive Democrats, many of whom have received the maximum campaign contributions from the Multi-Family Housing Association, then plotted to send the bill back to committee. They claimed this was an attempt to perfect the bill and bring more stakeholders to weigh in, but the use of vague terms like “stakeholders” typically translates to big business and landlord interests. Thanks to impassioned statements by Socialist Alternative members and other community members, the council was forced to agree to stick to the original implementation date of January 1st. Juarez was also forced into a defensive position over her support for her big business backers and tried to cover up saying: “I am committed to working with all stakeholders … I don’t want this to make this an ‘us vs. them’ issue”. But of course a victory for tenants is IS an us vs. them issue! The demand for more affordable rent is a demand to reduce the profits of the big landlords and property developers. This is why we need movements to fight for our interests when big business already gets a seat at the table, and it’s why we need more representatives like Kshama Sawant who don’t take money from big business and corporate landlord interests, instead fighting 100% on the side of the 99%. While the actions of Monday’s protesters did not secure an immediate victory, they did succeed in preventing an indefinite delay of the bill, and helped to shield it from undue tampering by sending it back to a committee chaired by Kshama Sawant. This means the struggle isn’t over. We can win if we continue building a fighting campaign to pressure the city council to pass the strongest legislation possible.